If you’ve ever heard the expression “run hard and put away wet,” then you know it’s not considered a best-case scenario. 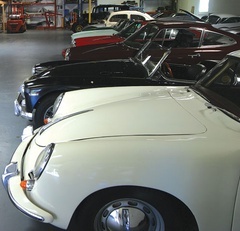 The fact is we’ve all seen cars that have received much more damage from bad storage than hard use. Fortunately, with a little bit of work and a couple of smart approaches, this damage can be avoided. Winter is right around the corner for many of us, so a few extra hours spent with the car right now can pay huge dividends when spring arrives and it’s time for that first drive of the season. Where you actually store the vehicle during the off-season is just as important as the procedure itself. Assuming there’s no covered space for the car at home, then there are basically four types of storage spots available: self-storage garages, generic storage “barns,” car storage specialists and extra space belonging to friends and relatives. You should be able to regularly inspect the car and at least enjoy looking at it when you can’t drive it. Good lighting and security are a plus, as is some degree of climate control. Large changes in temperature are going to increase the chance of condensation, so a facility that holds its temperature fairly consistent is a better choice. We’re not going to discuss outside storage, as we think it’s a pretty bad idea all around if you care about your car. While this may seem obvious, cleaning your car thoroughly has several major benefits when it comes to its long-term storage. First, any dirt that remains on the exterior may get ground into the paint should anyone lean or brush against it. That dirt and grime aren’t going to be good for the car’s finish, anyway, as most of it contains acids and other things that aren’t friendly toward paint, rubber and chrome. Papers and bits of food in the interior are only going to make it more likely to attract rodents or other stinky, damage-causing animals. And of course, it’s always nicer to start with a clean car in the spring so you can enjoy it right away without the chore of scrubbing it out before going for a drive. After you give the car a good exterior wash, if it’s time, put another coat of wax on it—that will give the paint just a little extra protection and be one less thing you’ll have to do in the spring. Next, remove all of the papers, trash and other personal effects that don’t need to be in the interior and then give it a good vacuuming. 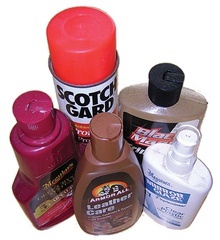 Clean the non-carpeted surfaces and then treat with the appropriate protectant. Before putting the car away for the winter, fill the tank with gas to keep condensation from forming in the tank. We’re not 100 percent sold on the effectiveness of “gas stabilizers,” but they don’t seem to hurt so you can throw some in the tank if you want the peace of mind. All of the other fluids—brake, clutch hydraulics, etc.—should also be topped off. Fresh oil is a good idea, too, since any contaminants sitting in your dirty oil will have several months to work their evils. Check the coolant/antifreeze and make sure it can withstand the coldest temperature the car will see during the winter. We also recommend having new or nearly new brake pads in the calipers to keep the pistons from being exposed and getting rusty. If the car has grease fittings, give them all a shot of grease to make sure nothing will rust up over the storage season. For those storing a convertible, raise the top and clean it as well. If you leave the top down during the storage season, it may shrink, wrinkle or mildew and become useless pretty quickly. Park your convertible with the top up to prevent mildew, wrinkles and shrinkage. Storing the car on junk tires and properly stowing the good tires in opaque bags helps preserve your driving rubber. With all the prep work done, now it’s time to park it. But first, take the car out for a good drive and warm it up well to burn off all the condensation in the drivetrain—plus this will give you a warm memory of your last drive of the season. Pull the car into its space and shut it down. Put it in gear, and block the wheels if necessary to keep it from rolling. Don’t set the parking brake as there is a chance it may rust or seize and make the car immovable later on. Whether or not the windows should be left open or closed is open to debate, but we believe that keeping them up is the best answer. Doing so keeps out critters and moisture; closed windows can also trap them inside, but this is to a lesser degree. Leaving the windows up also keeps their rubber seals appropriately compressed. There is also some debate regarding desiccants and moisture-absorbing products like DampRid. In theory, a car stored in a dry climate shouldn’t have a problem with moisture. However, even those of us in damp climates have found that these products yield a fresh-smelling car after a prolonged parking period. Once parked, it’s a good idea to disconnect and/or remove the battery. Having it disconnected will decrease the chances of electrical problems (or fires! ), plus lessen the chance of it draining during the storage season. You’ll want to check the charge of the battery from time to time during the winter, however. If you do remove the battery, keep it in a warm, dry, well-ventilated space if at all possible. Don’t forget to store the battery in such a way that it won’t damage anything should it leak. lar cars and you’ll find common areas where rodents camp out in your particular make and model. For example, mice love heaters, like the one in this MGA. Now it’s time for rodent prevention. If you’ve picked the right storage spot, this won’t be a problem. Still, some precautions probably won’t hurt anyway. 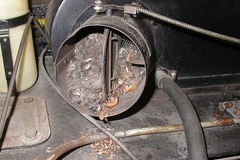 Rodents love to nest in interiors, air cleaners, exhaust pipes, heaters and other warm, cozy, secluded spots in your car. We have even found dead mice in engines, the rodents having climbed up an exhaust pipe and through the cylinder head before getting stuck inside a cylinder. If you have friends with similar cars, you may ask them where the mice like to live. For example, mice love the “trumpet sections” and master cylinder/pedal boxes found under the hoods of MGBs. Clean any previous rodent nests from these areas and make sure there is nothing in the car to attract these little creatures, like crumbs from your latest fast-food foray. If you can stand the smell of mothballs or other rodent-repelling inventions, put them in some of these common nesting areas to keep the pests away. It also never hurts to put a few mousetraps around each tire, since that’s the likely path of entry into the car and stopping them with a well-placed mousetrap could do the trick. Finally, don’t forget about the tires, as extended periods of inactivity can be tough on them, causing flat spots. Best-case scenario: Remove your good wheels and tires so they can be properly stored during the winter months, and bolt on a set that’s not so important. According to The Tire Rack, storing tires inside airtight, opaque bags that are then placed in a cool, dry location away from both direct sunlight and ozone-producing electric motors is the hot setup and will maximize their life span. If you only have one set of tires for the car, fill them to their maximum pressure—usually around 35 psi—and keep an eye on them. Allowing a car to sit on a deflated tire is a great way to damage the tire’s inner workings. While some people believe overinflating the tires will minimize flat spots, that move can actually stretch the tires and cause additional problems. Is the cover clean? A dirty cover is just going to damage your car. Can the car “breathe” under the cover? If the cover is too watertight, any condensation is going to turn your covered treasure into a terrarium; mold and mildew will be part of your spring harvest. Is the cover going to tempt somebody to sit on your car or use it as a shelf? We’re amazed how often we find people doing this, thinking the cover is good enough protection from their riveted jeans, belt buckles or boxes of stuff. Will you be able to inspect the car for rodents and other problems without hassles? If lifting the cover keeps you from periodically inspecting the car, small problems may turn into big ones. While you may choose to use a cover, we prefer to leave the car uncovered so we can easily make periodic inspections. This way we can quickly peek into the interior, trunk and underhood areas with almost no hassle and make sure nothing is amiss (or getting stinky). If the car starts getting dusty, we clean it off with one of those waxy car dusters. Some people will tell you to start your car from time to time while it’s in storage. We won’t. In fact, we recommend the opposite. Here’s why: If you start the engine, it’s basically going to run on the choke for awhile, and then on the idle circuit. Even if you rev the engine a bit, since there’s no load, it’s going to basically run on the idle circuit. Our older classic cars tend to run a bit rich even when the choke is off, and this starting procedure is going to wash a bunch of gas down the cylinder walls and into the oil—not a good thing. Plus it’s pretty common to see plugs foul out by doing this, which just means you’ve got one more thing to deal with in the spring. What about keeping the battery charged? This we recommend, but not by running the engine. Purchase a trickle charger and charge up the battery from time to time before it goes completely dead. You may want to install one of those battery maintaining trickle chargers in the car, although we’re somewhat skeptical of the cheap-o ones since they usually come from the Far East at prices too good to be true. Do you want to trust an unattended car to one of these gadgets? This is very important: Talk to your storage provider and your insurance agent and make sure you have written contracts and policies describing who will pay (and how much) for your car should the building burn down or encounter another catastrophe. Also, what if the car is damaged by another car, person or accident within the facility? After these discussions, read the policies and contracts to make sure that the agents are interpreting them properly and not just giving you lip service. 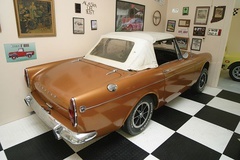 With respect to insurance, it will vary state by state and policy by policy, but you can sometimes drop coverage down to a “comprehensive-only” or “storage” policy during those months when the car is going to be sitting. Regardless of the regulations and policies affecting your coverage, make sure your car is appropriately insured for its storage situation. Some policies specify that the car be stored at home or in a certain kind of building. Others have other types of requirements that you want to make sure are being met. On a related note, carefully inspecting the car regarding condition and previous damage and taking some pictures before storing it are good ways to gather documentation for your insurance company, storage provider and yourself in case something bad happens. This is another reason for cleaning the car beforehand, as it gives you a good chance to look for things you may later blame on someone else. Once the car is safely tucked away for winter, it is time to plan for next spring. Time to work on that wish list of parts to add, upgrades to carry out and events to attend. And don’t worry about removing the car from storage by yourself, as we’ll discuss that part of the procedure in a future issue. Clean, clean, clean: A clean car will preserve better than a dirty one. Moisture is the enemy: Dry is as important as clean. Consistency is important: Temperature, humidity and UV light exposure should not change much. Store it as if you’re going to drive it: Fresh oil, a full gas tank and fresh fluids make removal from storage easy. Be fire safe: Disconnect the battery to reduce drain and cut the risk of an errant spark. If you know it’s going to be years before your car gets used again, you’ll need to modify our storage suggestions. 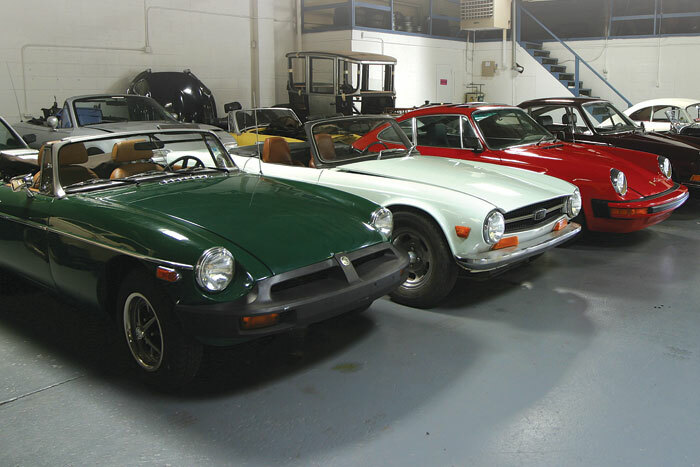 As we all have seen too often, cars that are improperly put into long-term storage tend to stay there indefinitely. The first and trickiest area is the gas. There is no easy answer to this predicament: While leaving the tank full will help stall the effects of condensation, gas goes bad pretty quickly and you’ll have to dispose of it before you start the car again. If you leave the tank empty or nearly so, there’s a decent chance that you’ll have a crusty mess in there when the car is later awakened. So you’ll need to pick your poison and do your best with this one. Next, drain the engine, gearbox and rear axle and then refill them with fresh fluids. This way you can be sure that you have uncontaminated lubricants in each of these driveline areas. Some people will overfill these components to keep things bathed in oil and stave off condensation and rust, but this will likely increase the chance of leaks and seal problems later. If you decide to overfill things, make sure to note it clearly so nothing is damaged upon the car’s return to the road. Drain the coolant/antifreeze and refill with fresh, quality fluid. Don’t leave straight water in the system, as our friend condensation will form a rusty mess if no coolant/antifreeze is present. Finally, you may want to remove the spark plugs and shoot some oil down the cylinder walls, or fog some lubricating spray in there. It will probably leak down past the pistons within weeks, but it will make you feel better. Make sure to reinstall the plugs—if you don’t, you’ll be sure to have a seized engine in pretty short order.